A chance business meeting at an energy conference kick-started the installation of a 1.12 MW solar power system at construction materials company Martin Limestone of Pennsylvania. How much of a role did fate play in the 1.12 megawatt solar system installation at construction materials company Martin Limestone of Pennsylvania? Quite a bit as it turns out. The project got its start at a chance meeting at the Pennsylvania Energy Management Conference. "We met Rick Naranjo, manager of maintenance and engineering of Martin Limestone, and found out the company was looking into a solar scenario with a third party owner, and they would buy the electricity," explained Tim Beiler, CEO and co-owner of Paradise Energy Solutions. "They had worked on a deal just a few months previous and had gotten close to closing, and then it fell through." The initial idea was to place solar panels on five acres next to Martin Limestone's New Holland, Pennsylvania, concrete facility, where there is a block-manufacturing plant, ready-mix concrete plant, a construction materials warehouse and store, a door-fabricating shop, and offices. The solar power would ideally provide nearly 50 percent of the facility's needs. Martin Limestone was intrigued by the idea of solar energy not just for the economic benefits, but because they also wanted to use green energy from a marketing and environmental standpoint. Energy did not close the project by the end of 2011, the investor would lose the Department of Treasury's 1603 grant program, which covered 30 percent of the project costs, as well as favorable bonus depreciation rules for solar energy systems. Luckily, short timelines were something Paradise Energy Solutions was designed to handle. Paradise Energy Solutions' sister company, Sunstream Energy (a separate entity that shares the same employees), became the investor on the project. "With that vertical integration, that really streamlined the process," says Beiler. "We were able to move quickly to bring a deal to the table and close it by December 15. We were also able to buy ground mount components that year to meet the requirements of the 1603 grant, which helped with financing." After closing, Paradise and Martin Limestone continued to work together, particularly with the township and county on the land development plan. "It was farm land already zoned as industrial property," says Beiler. "Martin Limestone has a good relationship with the township, and they worked with us there." There were two major concerns regarding the solar facility. First was the potential glare from the array that the residential development southwest of the facility might experience. That was put to rest by incorporating lattice-type material in the fence to help screen the homes. The second concern was storm water management. "We were able to show that by pile driving for the foundation, we weren't digging up dirt for the concrete foundation," says Beiler. "There was also space between the panels, which allows the water to drain, and it doesn't all run off the edge of an array." With that approach, storm water management wasn't required for the project. That was good, because the clock was ticking again. Construction got underway in August 2012, but the facility had to be up and running by the end of the year. Paradise chose 250-watt Mage solar panels, and 4,480 were used on the project. "We have worked with Mage for several years and have been very pleased with their performance, what they deliver, and their partnership with us," says Beiler. "They bring to the table a 30-year performance guarantee versus the 25-year industry standard. They also have a plus tolerance on their panels, so our 250-watt panels were tested to produce 252, 253, up in the 255 watt range, which brings some comfort level to the performance estimates as well." On the inverter side, Paradise Energy Solutions chose SMA 500HE inverters. The 500HE was ideal because it's designed to be connected to a medium voltage transformer, which was important on this project. "We had a situation where we were across the road, about 2,000 feet from the customer-owned medium voltage line," explains Beiler. "We were able to step up the voltage of the solar line right at the solar array. We stepped that up to a medium voltage, which made it much more feasible and efficient to go the several thousand feet to connect with Martin Limestone's electrical system." The medium voltage distance design Paradise developed turned out to be extremely cost-effective. Paradise was also able to use directional drilling to go under the road, avoiding problems with traffic or the road itself. 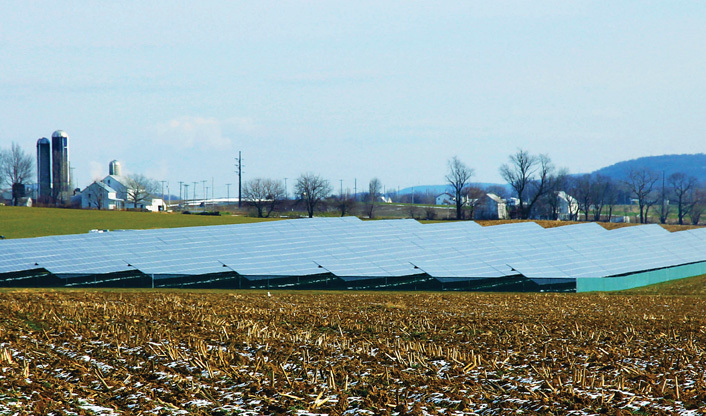 Paradise Energy selected 250-watt MAGE SOLAR panels for the Martin Limestone site, and 4,480 were used on the project. Paradise Energy has worked with MAGE for several years, and one of the factors in their choice of its panels has been MAGE's 30-year performance guarantee, versus the 25-year industry standard. With the year-end deadline looming, teamwork was key. Mage Solar worked to bring the panels in on the required timeline. Paradise was also able to use local subcontractors throughout the construction phase. They were even able to use some Martin Limestone products. For this project, Paradise Energy had SMA come in to commission their inverters, which meant tight deadlines to make the system operational by December 31, but it all worked out says Beiler. "We ended up commissioning the system on December 21, coincidentally the shortest day of the year." Sun Stream Energy, the long-term owner of the project, will assist in a portion of the monitoring. Paradise Energy Solutions also has a five-year warranty on the facility and will monitor it as well during that warranty time, and will probably continue on after that. The power is connected behind the meter, and when Martin Limestone isn't using all the power, the excess will back feed out to the utility. In many cases, it will just diminish their demand during peak times, lessening their requirements from the utility. In a few months, as temperatures warm up, Martin Limestone will see the biggest benefits from the solar power facility. Because they manufacture during the day, they will be able to take advantage of the solar power when it is at its peak. "In addition to the electric savings and their kilowatt hour offsets, the facility will potentially save the company on demand charges for their peak demand," says Beiler. "Regardless, it will definitely bring some relief to the local grid during hot, sunny days when it's producing power for the area as well." This kind of project is fairly common for Paradise Energy, which does primarily small commercial and some residential projects and installed approximately 2.6 megawatts last year. The company is based in Pennsylvania and licensed to do business in nine states in the Northeast. They employ about 35 employees, and every one is provided solar training. "We're very proud of our highly-trained employees, and we want to make sure everyone out there installing these projects for clients is knowledgeable and has a basic understanding of the technology they're working with," says Beiler. The company currently has many employees with NABCEP certification, and they are constantly building that number. Another thing that makes the company unique is that its PV systems include a performance guarantee for the first two years. If the facility doesn't produce the power guaranteed, Paradise Energy will pay the customer the difference at their electric rate. "We really want to bring peace of mind to our customers and provide reliable, long lasting systems," says Beiler. Beiler only sees things getting better for the solar industry. "I've seen this trend and I think it's going to continue—raw material prices are continuing to come down as the industry matures and manufacturers consolidate. On the installation side and the end-user side, we're also seeing lower levels of subsidy. As our costs diminish, the subsidies are diminishing, which is working." With that shift, Beiler is seeing solar investments becoming more secure from a financial perspective because solar power is becoming more dependent on electric savings, versus SREC and similar programs. "I think that shift is making our industry more stable," says Beiler. "On the other hand, it's still a very policy-driven industry, not just on the tax side, but also on the utility side, in terms of state utility requirements. So it's important that it's predictable to some level for the industry to stay stable, but I'm definitely seeing a bright future for solar, and we're in the midst of all this." It's also important to keep networking. Because you never know what chance meeting could turn into a successful project.